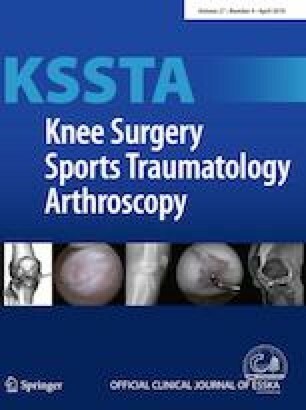 The current study aimed to evaluate how open-wedge high tibial osteotomy (OWHTO) without the release of medial collateral ligament (MCL) changes in vivo intra-articular joint space after the surgery. Patients with varus malalignment of the knee with an indication for OWHTO were included in this study. The intra-articular gap was measured before and 30 min after OWHTO without MCL release using a series of calibrated nerve hooks. The association of post-operative gap size with varus angle, medial proximal tibial angle (MPTA), lateral distal femoral angle (LDFA) and joint line convergence angle (JLCA) was also assessed. A total of 42 knees from 38 patients were evaluated. The mean size of the intra-articular gap of the medial compartment was 5.2 ± 1 mm before the osteotomy and 3.1 ± 2.2 mm at 30 min post-osteotomy. The size of the intra-articular gap decreased post-operatively in 30 knees (71.5%), increased in eight knees (19%) and remained the same in the remaining four knees (9.5%). Smaller MPTA and more correction were associated with a decrease in gap size after the osteotomy (p = 0.01 and p = 0.03, respectively). A significant negative correlation was observed between the correction size and the gap size after osteotomy (r = − 0.317, p = 0.04). Intra-articular pressure of the medial compartment increases in the majority of cases following OWHTO without MCL release. Until the factors affecting this increased pressure are thoroughly identified, MCL release seems to be a wiser option during OWHTO. AB made substantial contributions to conception and design of the study. MJ supervised the study and did the surgeries and gap tests. AM analysed the data and prepared the first draft of the article. AKH was responsible for radiographic data collection and patient recruitment. MA assisted in the surgeries and critically revised the article for important intellectual content. HY was involved in drafting the manuscript and assisted in the surgeries. All authors read and approved the final draft of the manuscript. This work was supported by Iran University of Medical Sciences (Grant no. IR.IUMS.FMD.REC.1397.243). This research was conducted in accordance with the 1964 Helsinki Declaration. Informed consent was obtained from the patients before their participation in the study.